Want to win a THOUSAND dollars ($1000/N200,000) for yourself? Well, here's what you have to do! 1. Listen to Leba by Morientez. 5. Add #LEBA and #Morientez to your Video Caption when you Upload. NOTE: The video adjudged to be the best and most innovative will be chosen as the winner. 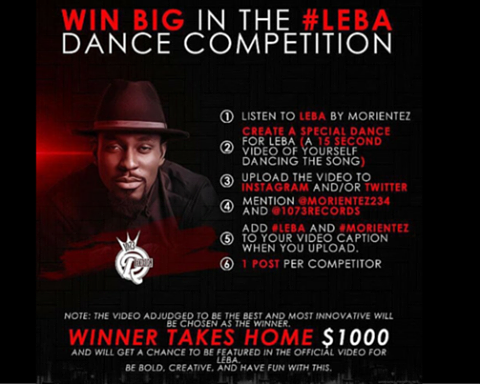 WINNER TAKES HOME $1000 and will get a chance to be featured in the official video fro LEBA. Winner will be picked based on creativity and hot steps! So, are you gonna dance o??!! !